Sloe gin has a lousy reputation. Red, sugary, and fruity, it is a hallmark of sweet, pink, “girlie” Spring Break drinks with lurid and lascivious names. When I was in high school (this was some time back, you understand), it was one of the faddish amusements of the senior girls, at least some of the ones I hung around with. It has become, with time, something of a déclassé laughingstock, another of those bottom-shelf, sugared vodka spirits made with laboratory flavorings and dyes. I assume there is “real” sloe gin in other parts of the world, but it has a long way to go if it wants to be respectable again in the US. Fortunately, it has made a start in the form of Plymouth Sloe Gin. I have no idea what was on Plymouth’s corporate mind when they decided to bring their excellent sloe gin into this market, given the category’s overall lack of respectability. Plymouth’s sloe gin is a different liqueur altogether. Made with real gin and real sloe, it has good, round herbal and fruit flavors—none of that flat, metallic laboratory flavoring. It is a very pleasant liqueur with only a modest sweetness—something you might actually drink—and it makes classic sloe cocktails interesting again. Stir both ingredients with ice until cold; strain into chilled cocktail stem. No garnish. I have heard that there is at least one other quality sloe gin in the US market, but Plymouth’s is the only one available in my region right now, and I can recommend it. The Calvados Coquerel VSOP brandy worked very nicely in Savoy Tango. I suspect that Laird’s apple brandy (not the applejack) also would make a flavorful, and not very expensive, Savoy Tango, and I look forward to trying that sometime. 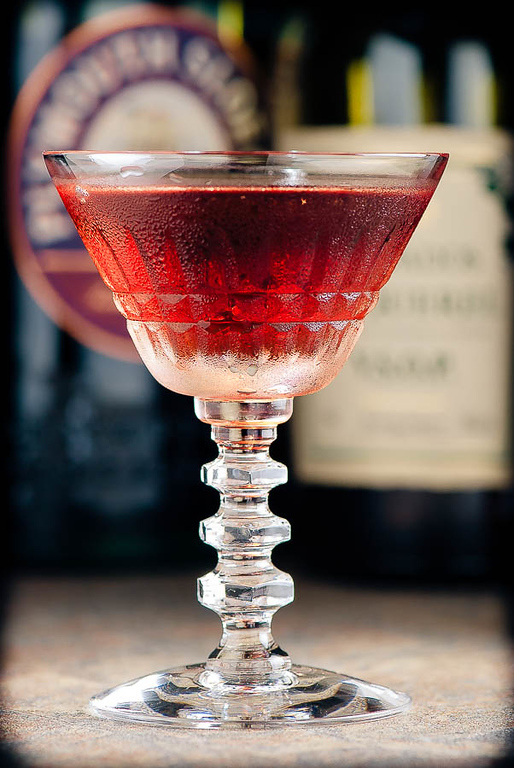 “The Savoy Tango — sloe gin’s revenge” at cold-glass.com : All text and photos © 2013 Douglas M. Ford. All rights reserved. This sounds lovely. I’m going to take another look at sloe gin. I’m interested to see how it substitutes for other sweeteners and liqueurs—like grenadine, for instance, or other red fruit liqueurs. I hope you enjoy the Savoy Tango. argh, synchronicity is attacking me again. I haven’t thought about sloe gin in years and in the last three days I’ve read a book about it, been asked by my husband about it and now it’s here! It does sound good. Off to see if I can get it though my state liquor system. Interesting how these things work sometimes. I hope your shops carry it. Happy tangoing. Maurin Quina, I’ve not heard of that before. There’s always something new to learn. I hope your explorations turn up something really great. Mr. Ford. I can recommend another Sloe Gin. That of Monkey 47. A handcrafted small batch gin, made in Germany. They make a seasonal Sloe Gin that is well worth the hunt. Unfortunately it like their gin only comes in 500ml bottles. I’ve not seen Monkey 47 in my market; I’ll watch for it. Thanks, Zachary!